Mark Longden writes about and loves alternative and experimental cinema. 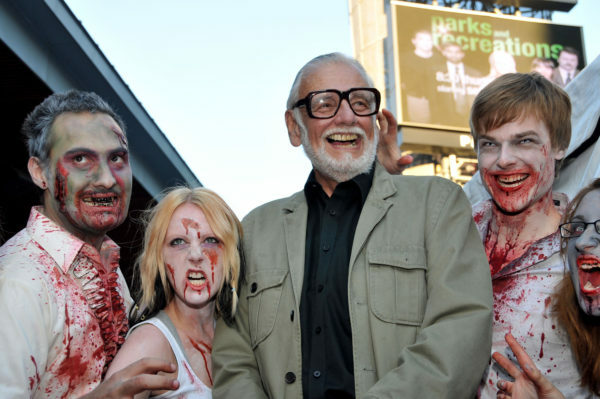 He is an occasional writer for this blog and this is his tribute to the godfather of Zombie films, George A Romero, who sadly died on 16 July 2017. Thus began the career of George Romero, not just the most important horror director of all time but among the greatest figures of cinema – a career which sadly came to an end this week with his death. George A Romero was to cinema what Albert Einstein was to physics, Babe Ruth was to baseball, Chuck Berry to Rock and Roll, or Buzz Aldrin to space exploration – a legend in his own time, and a man more than deserving of the title. He was The Great One to which all who came after aspired, and very few ever came close. He made Dawn Of The Dead, in the running for greatest movie of the 1970s. This was the era when angry political cinema came alive – as well as classic after classic with Martin, The Crazies, Day Of The Dead and lesser known but still brilliant movies like Season Of The Witch and Knightriders. Along with Dennis Hopper, he was one of the main inspirations for that 1970s new wave. But we’re not just interested in horror cinema here, and it’s both the man Romero was and the art he produced that interests us. If you knew nothing else about him, the tribute from Jordan Peele, the writer/director of this year’s extraordinary Get Out, that “Romero started it” would tell you a lot. Romero was angry that the 60s hippy movement had changed nothing, and channeled that anger into his art – and yes, a cheaply made movie about the dead coming back to life is definitely art. He saw the American empire for what it was, and the only way he could really get across how disgusted he was by it was to represent it as a horde of the undead. If there’s something I’d like to criticise, I can bring the zombies out, and I get the financing that way. So I’ve been able to express my political views through those films. Dawn Of The Dead takes a swipe at, among many other things, 70s consumer culture. Day Of The Dead skewers the military-industrial complex and Land Of The Dead is about the era of mass protest and the wars in the Middle East. The Crazies is the most entertaining movie about environmental disaster ever, and Martin is a vampire movie with a lot to say about alienation. I’ve always had a sneaky admiration for someone who can slip genuinely subversive messages into popular art forms, and Romero was the master of it. But to me, this is a story about people holing up in a city and believing they’re safe because they’re surrounded by water and the administration is telling them there is nothing to worry about and that they’ll take care of everything… It’s very important that the movie be entertaining on the surface, but it’s equally important to me that it reflects something about the times. We shouldn’t just be thankful for the work Romero did, but for the people he influenced. He took a chance on a local punk video-maker called Peggy Ahwesh, who blossomed into one of the most fascinating voices in experimental cinema. He inspired Jordan Peele to make a movie as amazing as Get Out. Every story about him resonates with his generosity towards people he could have happily ignored – fans at conventions, other horror filmmakers, writers. The world is littered with political art which, despite coming from a good place, can be humourless and not speak to the people it needs to speak to; which is why it’s so wonderful that we had someone like George Romero around for so long to give us revolution with a ton of jump scares, blood and guts.